MARS Gallery are proud to announce sculptor Laura Woodward has been selected to create a new piece of major public art in the Docklands. Woodward’s winning proposal was chosen among a selection of Australian artists who were invited to pitch for the public art commission. Woodward will begin production on the new public artwork titled ‘Murmur’ in June 2016 with installation into the laneway of the new Marina Tower mixed-use development proposed for May 2017. Located on the corner of Docklands Drive and Pearl River Road in New Quay, developed by Meteorite Group (part of Hiap Hoe Limited, listed on the Mainboard of Singapore Stock Exchange) and designed by DKO Architecture, the Marina Tower mixed use development will consist of 461 apartments, over 42 storeys, and a 273 room hotel operated by Starwood Hotels & Resorts Worldwide under the brand of Four Points by Sheraton. Based in Melbourne, gifted artist Woodward has been creating sculptural kinetic installations for several years and exhibited her work in solo and group exhibitions throughout Australia. Woodward is a lecturer in the School of Art at the Victorian College of the Arts, Melbourne. MARS Gallery Director and the project’s art consultant, Andy Dinan said, “Reminiscent of New Quay’s history as a bustling port, at times, ‘Murmur’ will move intensely, with brightness that converges and then dissolves in seconds. Allowing passersby to discover something new every day”. “Waves of light that start at each end of the lane tantalise passers-by to wander in, following the light forms and in doing so discovering the laneway itself. Enhancing pedestrian engagement with the lane, motion sensors cause these lights to subtly respond to visitors, creating moments of unexpected delight,” said Dinan. “‘Murmur’ is responsive to the architecture and the creation of Place, draping itself around the heavy orthogonal lines of our two towers burying their legs into the ground plane. Together with her incredible technical knowledge, ability to articulate this clearly, and her production experience in urban interventions, we knew that this was the artwork we were wanting to engage with both the architecture and the public.” said Jonasson. Thank you for dropping by; I hope you are enjoying perusing this new-look website. I must admit, however, that I have had little to do with its manifestation. My inimitable studio assistant, Sarah Jane Haywood, has built this beautiful beast from scratch: working for several months to move more than a decade's worth of practice and documentation from the old site to the new; as well as adding new sections to cover my growing research practice and to incorporate my (oft neglected) blog (which one hopes will be less so now that it is more readily accessible within this site). So, this is a long way of saying: thank you for the website Sarah. However, to leave it at that is to leave out the many other thanks that are owed to Sarah Jane. Sarah has worked in many capacities with me for several years now (including running our CNC machine at Like Butter, being an amazing contributor in her role in Rising: the Victoria Harbour Young Artist Initiative, and generally being involved in the mad rush up to every exhibition I have had for the past five years. She even MC'ed our wedding last year!). Sarah officially moved into an ongoing role as my assistant two years ago. This means that she is still on the mad rush up to every exhibition (of course), which now includes supervising and training others in the idiosyncrasies (and infuriations) of kinetic sculpture assembly and installation. She also assists with many other things, particularly the day-to-day running of Ironside Studios. In 2015 Sarah put her strengths in media and social media to work, undertaking a dedicated media campaign to promote my exhibition "Writhe" at Ararat Regional Art Gallery, securing numerous publication outcomes in the process. And of course she built this site. In short: Sarah is an amazing young woman who has contributed significantly to my practice over the last five years. Her strength and care carries through everything, both in working relationships and in the work itself. It is a delight to have worked with her now for so many years and in so many capacities. For some reason (ahem) we always find ourselves in intense situations: from the month that was Lorne, to working with the wonderful Rising students. Sarah's approach - her calm, her humour, her intelligence, her friendship, her many and varied skills, and her grace under (often various and overlapping) pressures - has been invaluable to me over the years. It has also been a pleasure seeing Sarah's own practice grow, as these same strengths manifest in her astonishing, humbling works. So, thank you Sarah. And here's to another amazing year ahead! Stephen Haley wrote a beautiful essay for the catalogue for my exhibition Writhe. You can find the full essay here. Laura Woodward's major new work, Writhe, is currently on show at the Ararat Regional Art Gallery. You are warmly invited to join us for a floor talk by the artist followed by an opening celebration. 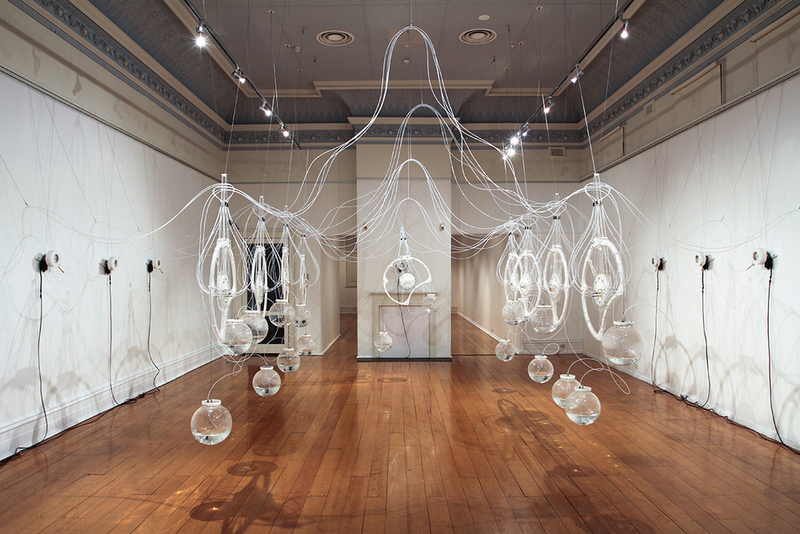 Writhe is a major kinetic installation developed specifically for Ararat Regional Art Gallery. This is Woodward's first major exhibition in a regional gallery, and draws together several strands of enquiry: Woodward's ongoing fascination with water-powered mechanisms; the potential of shadows generated by viewers and kinetic components; integrating site-specificity and architectural-responsiveness; and the continual development of the ongoing, circularly-causal systems that drive Woodward's installations. Writhe comprises dozens of small mechanical components, each contributing to the larger ongoing kinetic system. Its scale meets the architecture of Ararat Regional Art Gallery's soaring ceilings and historical architectural details. Writhe's ambitious, nebulous, suspended sculptural form generates vast and dynamic patterns of movement which emerge and dissolve as the system continues, literally moving through its ongoing circularity. Public Transport: Vline trains run from Melbourne to Ararat via Ballarat. The timetable can be viewed here. Growing up on a farm, Laura Woodward was always around and interacting with machinery. “Making things is something we did a lot as kids,” she told SPOOK, and as a result, machinery and mechanisms have come to influence the Ballarat born Melbourne based artist who creates expansive kinetic installations. This week I was interviewed by the lovely folk at Spook Magazine about art, process and my new work Writhe, opening next week at the Ararat Regional Art Gallery. You can read the full interview here. Tomorrow night Laura Woodward will be presenting two new works, as part of an exciting group exhibition at the Town Hall Gallery. Join us for the opening tomorrow night, Tuesday the 19th of August, 6-8pm at the Town Hall Gallery, 360 Burwood Road, Hawthorn. Artists observe the world, translating what they see and feel into creative expression. They carefully filter our reality and provide us with new ways to understand our place in the world. But more than just interpreting, they actually re-make the known universe through their creative acts. Composing Common Worlds brings together artists who explore the ways in which we understand the nature of our environment. Driven by ideas about the relationship between humans and nature, and questioning the very need for this division, each artist explores ways of positioning ourselves within the world. Presenting multiple art forms from each artist the exhibition also offers a unique insight into the way artists produce material expressions of conceptual ideas. Artist: Sam Leach, Juan Ford, Stanislava Pinchuk (MISO), Cameron Robbins, Laura Woodward, Hanna Tai. Curated by Dr Kent Wilson. 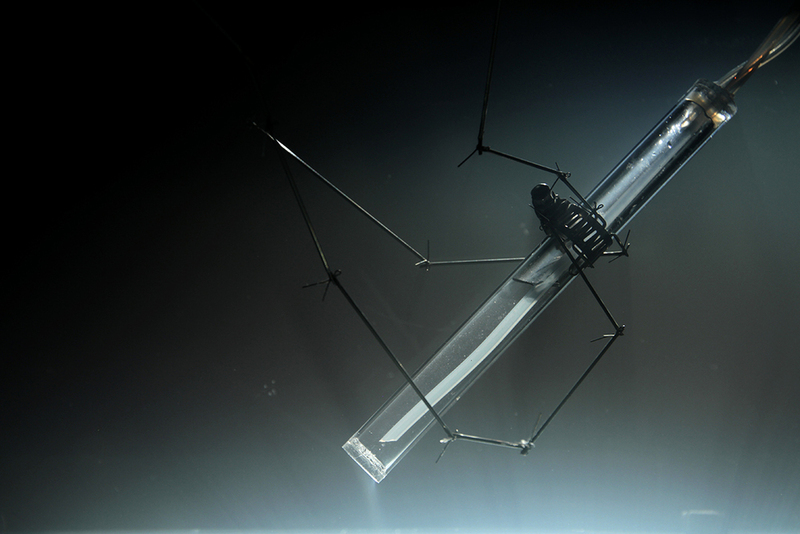 "There’s a tradition going back to early biological researc that looks at life as a system. Thinking of forms of life as sets of relations working together within definable boundaries spread from biology and made its way into cultural contexts. The study of systems has developed into a discipline in its own right, extending on ideas about plant cells to forest eco-systems and on into radar defence systems and the behaviours of financial markets. The underlying core concern is an appreciation of the interconnectivity of things. That the system is itself the a priori form and materials coalesce at various times to realise their collective nature. Laura’s works are captivating systems of representation and abstraction. She has deftly conjured functioning systems as self-referential, self-contained entities. Designing, engineering and manufacturing most of the components and processes herself she has delimited the extraneous while orchestrating the elegant. These works are what they are, they are of themselves and in that purity they resonate as self-similar reflections across scales, categories and time." Kent Wilson wrote a very insightful essay about my exhibition Introverted. You can view the full catalogue here. In an act of blog-fail guilt (last post in December? Holy moly! *), herein I post a slightly altered version of a piece I wrote recently, to contribute to the first stage of a multi-phase exhibition project in which I had no actual artwork. Recently, I've been thinking a lot about analogue systems. 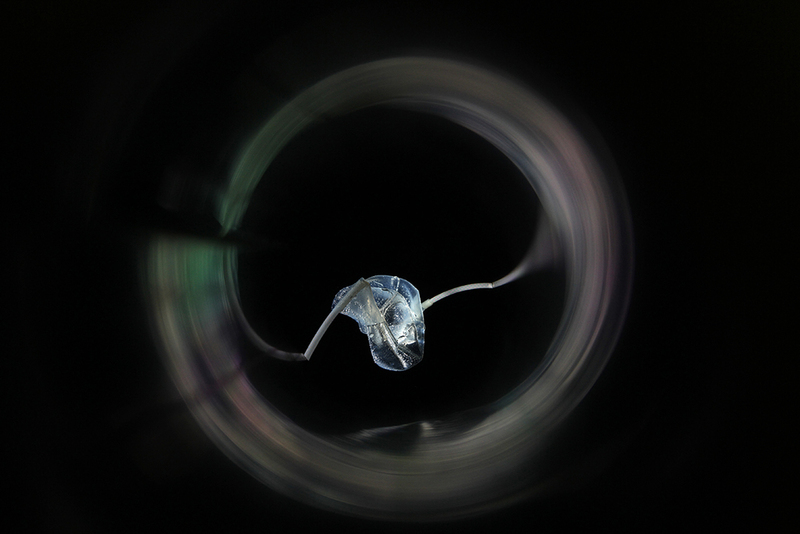 My current studio work has focused on looping systems, with no start or end point. Due to the nature of these systems, each element, both electronic (motors, relays and switches) and mechanical (sculptural elements in motion) is crucial to the ongoing action of the work. Of late, however, these systems have come to feel rigid, pre-determined, and overtly authored. Subsequently, I have been attempting to create systems which are self-regulating, with self-generated sequencing. In short: I want to make systems in which I, as artist-creator, take little part. Unpredictable, random, ongoing systems. My current experiment has proven this to be a very difficult (I am not yet ready to concede impossible) task. Why should it be so difficult to make a random yet ongoing system? I suspect that the dilemma actually lies in language. For, in actual fact, systematic and random are antonyms; to be systematic is to defeat randomness. To have a system that is ongoing and self-contained, and also random or self-determined, has so far eluded me – and perhaps this is why. Quite possibly, these two hypothetical ideals – the ongoing (and in reality, gallery-suitable) looped system, and the self-determined, random, unpredictable system – are mutually exclusive. The current experiment suggests this may be the case. Hopefully the next experiment will prove otherwise. * Dictionary spelling check-up was required here. Holy moly. This blog combines Laura's various musings upon artistic practice, practice newsletters, catalogue essays, and documentation of the processes through which her intricate systematic installations emerge. Welcome to my new website. And an important thank you.